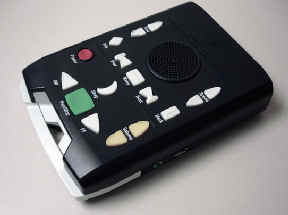 The Talking Book and Braille Library has been distributing digital talking book machines (DTBMs) and digital books since October 2009. The digital books (DB) and magazines are on a USB flash cartridge about the size of an old cassette tape that slots into the inset USB port in the front of the player. There's only one way to insert the book. One end is beveled for easy insertion, while the other has a round finger hole so that you can easily extract the cartridge from the player. The USB port on the right side of the player is used for a USB flash thumb drive, for members who download multiple books and magazines from BARD. Every digital book will be on one cartridge only. Magazine cartridges usually contain a number of weekly and monthly magazines. Braille and Audio Reading Download (BARD): Digital books are also available online, via BARD, and BARD members are now also able to download books and magazines using the BARD Mobile App for Apple and Android devices. The machine is powered by a rechargeable battery. We suggest that you plug it in when not in use so that it retains its charge. If a player malfunctions at any time, contact TBBL for a quick replacement. NLS gives members the choice of using either a standard player or an advanced player. TBBL recommends the advanced player because its additional controls make navigating within books easier than in the standard player. View a larger image of the standard player, with control buttons labeled and described in detail. The standard machine has eight controls for the basic operations for listening to a book. 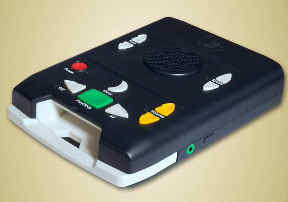 View a larger image of the advanced player, with control buttons labeled and described in detail. a button to set "bookmarks" that you can return to.